It says, "In Jeschurun I am in the company of Luzzatto, better than Szold, Wise and Illoway." This refers to the Jeschurun published by Joseph Kobak, not Samson Raphael Hirsch (of whom Bondi was a critic). And he is talking smack about some famous names among the American rabbis of his day - one of whom - Wise - would become his son-in-law! Apparently he liked the company in Jeschurun, but not the American Jewish publications of the day. * Not 1865, as in the transcription here. This is an interesting piece that I found on the Isaac Leeser digital archive (link), a handwritten letter from Rabbi Esriel Hildesheimer to the Occident, dated 26 Adar 5625. The letter asks Leeser to print an English version of an account on behalf of the "Central Committee for Building Dwellings for the Poor and Pilgrims in Jerusalem," of which Rabbi Hildesheimer was a member, along with Rabbis Jacob Ettlinger of Altona and Joseph Hirsch of Halberstadt. I don't know for sure if this is Rabbi Hildesheimer's own English, but I'd say - chances are. journal in at possible great parties. Here is a postscript from an 1853 letter from Samuel Hyman Cohen to Isaac Leeser. Writing from California, Cohen tells Leeser which family he is from, that he is the nephew of "Moses Eliezer Solomons 'ר משה עליעזר זלמן" [sic] "of London and the only english Jew that ever wore his Beard." "I was verry (sic) ancious (sic) to obtain from him Information respecting the Jews and after showing him my מחזורים מזוזת ערבה כנפוס תפלין and explaining them to him, he said that he was satisfied that I was a Jew, he give me a Invitation to come out to see him..."
This guy *really* likes how Chasidim/ traditional east European Jewish men looked. 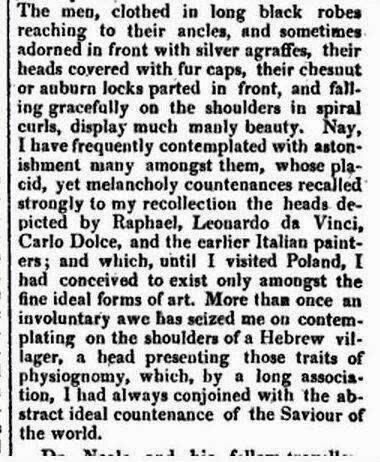 Adam Neale, writing in 1818, in his Travels through some parts of Germany, Poland, Moldavia, and Turkey.